Precision Delivery System for upright product delivery. Available by cash, check, credit card, or finance/ purchase lease options. EARN $$ MONEY $$ WHILE YOU SLEEP! 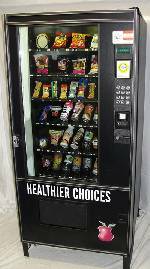 OUR HEALTHY CHOICE MACHINES ARE THE MOST DEMANDED MACHINES IN THE USA AND ARE APPROVED FOR PRIVATE & PUBLIC SCHOOLS AND ALL LOCATIONS THROUGHOUT THE COUNTRY. AUTOMATIC PRODUCT ROTATION FOR FRESHNESS. EASY TO LOAD AND PROGRAM. 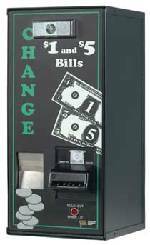 "GUARANTEED" DELIVERY SYSTEM (NO MORE HANG-UPS & MACHINE WILL REFUND. MACHINES CAN BE SHIPPED DIRECTLY TO YOUR WAREHOUSE OR PICKED UP AT NEAREST FREIGHT TERMINAL AT NO ADDITONAL COST FOR MOST STATES. 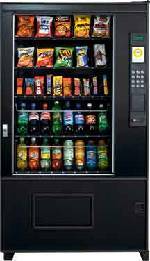 OTHER HEALTHY MODELS AVAILABLE :SNACKS, DRINKS, CANDY, PASTRY, FRESH OR FROZEN FOOD,ICE CREAM, OR ANY KIND OF MACHINE YOU MAY NEED. 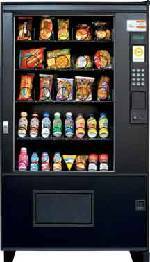 ALSO AVAILABLE IS A HEALTHIER CHOICE MACHINE SPECIALLY DESIGNED FOR OUTDOOR SALES, AND ALL MACHINES ARE DESIGNED FOR ENERGY SAVINGS. PRICE INCLUDES SET UP, LED LIGHTING, BID PAD FOR PRODUCT PROTECTION, AND YOUR CHOICE OF PAYMENT SYSTEM INCLUDED IN PRICE. ALSO INCLUDED: (3) YEAR WARRANTY ON REFRIGERATION UNIT, (3) YEAR WARRANY ON SENSOR BOARDS & CONTROL BOARD, AND (1) YEAR WARRANTY ON ALL OTHER PARTS, EXCEPT FOR GLASS AND PAINT FINISH. The VISI-DINER has the same 1/2 plus hp compressor and extra insulation as the VISI-COMBO but has six trays with larger helix pitch openings to accommodate packaged food. This vendor also has in its software a health-and-safety function which has an error flag that, if triggered by unsafe conditions, will disable all MDB devices and prevent the machine from vending any product. This protects the consumer from purchasing spoiled products. And Visi-Diner, like all AMS' indoor merchandisers, comes in both a 35'' and a 39'' width. 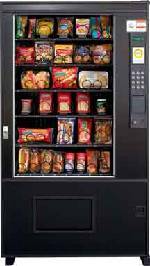 The AMS Sensit Snack vendor provides the customer with a wide selection of options, including different helix configurations and pitch openings. Refrigeration is also available on this vendor. 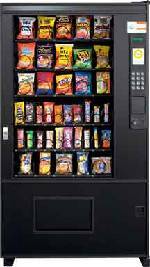 These snack machines are available in two cabinet widths: 35" and 39"
*WE GUARANTEE TO BEAT ANY COMPETITIVE PRICE!! New from AMS and Sensit. 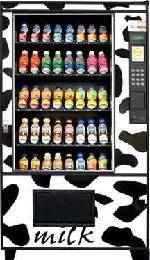 Customers can offer lunchtime vending with a single 35" or 39" merchandiser. Sandwiches or subs and other foods, along with bottled dairy beverages, can all be dispensed from this versatile bottle and food combo. While various configurations are available, basic models feature three trays of food and two of dairy (197 units in 39'') and four trays of food and two of dairy (241 units in 39''). The Outsider is a rugged outdoor vendor offering a choice of Snack and Visi-Combo (snack and bottled beverage) configurations. A heavy-gauge steel lock-cover, additional glass-front protection, and vandal panels add to all the other standard AMS features to make this merchandiser just what you need for the great outdoors. Vendor avaliable in black. The VISI-COMBO has two bottle trays that use the same helix delivery system as the snack trays. 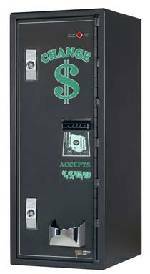 These machines have a 96-bottle capacity with the ability to vend various size bottles. The three snack trays can be configured to any combination of snacks or candy helixes. The VISI-COMBO is chilled by the 1/2 plus hp compressor and has a heated triple-pane glass front to reduce condensation. The door system also provides more insulation in critical areas. This machine provides the operator flexibility and the option to have a machine that can furnish a greater selection of products. Visi-Combo comes in 35'' and 39'' widths. Available in Black: GRAPHICS NOT INCLUDED! Available in either instant or fresh brew configurations, the Geneva dispenses a broad menu of premium and specialty coffees, and teas and serves them just the way your customers like them. With a state-of-the-art brewing system and precise ingredient controls, they are ensured a high quality cup each and every time. 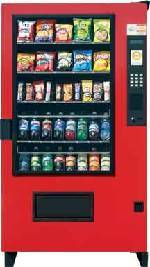 Description/ Specifications: Our Full Line Used Vending Machines are available for $150.00+. 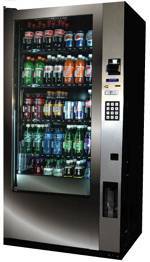 Soda, Snack, Frozen, Sandwich, Coffee, and Combo machines are available. Please call our office for specifications and/or prices. 1(800)270-VEND(8363) or 717-993-9931. "WE GUARANTEE TO BEAT ANY COMPETITIVE PRICE!" The Outsider is a rugged outdoor vendor offering a choice of Snack and Visi-Combo (snack and bottled beverage) configurations. A heavy-gauge steel lock-cover, additional glass-front protection, and vandal panels add to all the other standard AMS features to make this merchandiser just what you need for the great outdoors. © 2019 A Kovens Vending Corporation - All rights reserved.